Amateurs and professionals gather in U.S.
Fireballs streaking across the sky provided an extraordinary light show for astronomers and amateur observers who camped out on deserts and beaches and logged on to Web sites to watch the Leonid meteor shower late Wednesday and early Thursday. "I see this as nature's contribution to the celebration of the new millennium," said Ariel Cohen, a professor of atmospheric sciences at Hebrew University in Israel, where a streaking canopy of shooting stars delighted observers overnight. In the Arabian desert, astronomers called it the most glorious display of a meteor storm in 33 years while other regions, such as parts of Great Britain, had a more sedate show. In the freezing cold of Jordan's desert, about 50 astronomers from around the world sighed with wonder as fireballs blazed over the sand like lightning. "This experience was exceptional. I have never seen a shower in my life, and I've been in the field for the past 25 years," astronomer Georg Dittie of Bonn, Germany, exulted. Israeli astrologers were treated to a extraordinary display over the Negev desert and NASA scientists flew in from the Azores to see it. In Spain, on a beach near Valencia, streaks of sparkling light rocketed silently overhead in the cloudless night. A half-dozen observers murmured in admiration as multiple meteors burst into the atmosphere. Four whizzing together like an airplane squadron crossed overhead, buzzing the constellation Orion. "That's worth the price of admission!" one spectator said. But clouds blanketed some skies over Great Britain, dimming the display. "It is a disappointment, but we are at the mercy of the elements," said John McFarland, an astronomer at the Armagh Observatory in Northern Ireland. "It's been overcast all night and I haven't been able to see anything at all." Although astronomical calculations had forecast the best view was in the Middle East and Europe, professional and amateur sky watchers in the United States also took up positions on mountain tops, in fields, and just about anywhere away from city lights. Millions logged on to a NASA Web site to watch a live Webcast of the Leonids as the shower was monitored by a weather balloon. The best conditions had been predicted on the East Coast, but the spectacle was sedate in many locales. In Williamstown, Massachusetts, two classes of astronomy students from Williams College took notes from a country road off campus. Lydia Haile, who lives outside Baltimore, said it was the first time she had ever seen shooting stars. Dozens of enthusiasts, including families with small children, fixed their gaze skyward from Hard Labor Creek Observatory in Rutledge, Georgia. Some occupied themselves peeping at planets through telescopes while waiting for meteor action to intensify. Others watched from lawn chairs. John Wilson, an astronomer for Georgia State University, said he came for the same reason as casual sky watchers: "It's mainly a lot of fun to go out and 'ooh! and aah!'" 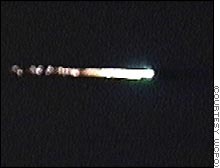 Most satellites appear to have weathered the meteor storm intact. There had been concern that the tiny fragments hurtling through the heavens at 150,000 mph (240,000 km/h) would smash their mirrors. A spokesman for Britain's Ministry of Defense said, "We have had no reports of any damage or problems." In Moscow, a spokesman for Russian Strategic Missile Forces, which runs the military satellite program, said: "The meteor rain did not lead to any disruption in the work of Russia's orbiting satellite group and they are working in normal mode." Commercial operators were also able to breathe a sigh of relief. Satellite consortium Globalstar changed the angle of several of its 48 satellites to ensure they were not hit. The global average peaked about 9 p.m. EST Wednesday in a storm of 1,688 meteors per hour, according to NASA's monitoring station at the Marshall Space Flight Center in Huntsville, Alabama. It fell short of some predictions but still blew past the threshold of 1,000 meteors per hour to qualify as a meteor storm. "The mood was elation," said aerospace engineer Bill Cooke of the National Aeronautics and Space Administration. "It fully lived up to our expectations." The quick, two-hour storm, which may be the most intense for decades to come, was probably the most studied in history. Some shooting stars will still be visible at least through Thursday night, scientists said. The meteors form when dust and ice pellets shed by the comet Tempel-Tuttle hit the Earth's atmosphere at 40 miles a second and burn up. The shooting stars and fireballs can dart anywhere overhead, but all appear to come from the direction of the constellation Leo, which gives the shower its name. Since the orbiting comet dumps extra debris every 33 years when it races past the sun, the chances for a true meteor storm rise very 33 years. The last great storm was 1966, with a peak of 144,000 shooting stars per hour. A typical year might yield just 20 per hour. Last year reached 270 an hour. NASA studied the composition of the Leonids with special equipment aboard two airplanes. Jerusalem Bureau Chief Walter Rodgers, The Associated Press and Reuters contributed to this report. The Leonids are back: Will they storm or fizzle?